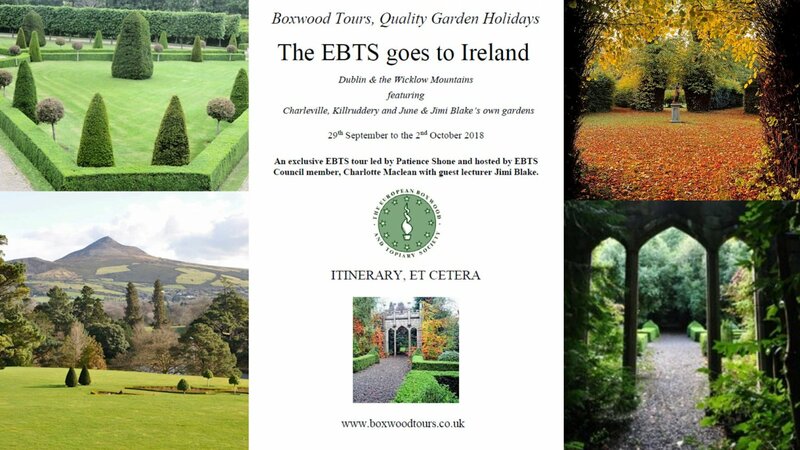 Boxwood Tours will be taking EBTS on an exclusive tour of contrasting gardens with the emphasis on their use of topiary and trained plants from the little know Masters Garden in Dublin with its formal structure to the intimate Corke Lodge of informal shapes. At Powerscourt we will gaze on the most famous of Irish garden views and close by at Charleville, a privately-owned Palladian Mansion we will discover the incredible walled garden subdivided into several further contrasting rooms including a slightly drunken avenue of yew flasks. We will visit several private gardens & enjoy the hospitality of the owners. Our base will be the comfortable Glenview Hotel. Jimi Blake will introduce us to the area on our first evening while we settle in to enjoy a few days of fine gardens, good food and engaging company, all essential ingredients for a great EBTS Garden Tour.